Former DOT commissioner Iris Weinshall, Senator Chuck Schumer, and former deputy mayor Norman Steisel are waging a campaign to overturn a street safety project initiated by their neighbors and supported by most of the local community. If the goal of the Prospect Park West bike lane lawsuit is to smear the Department of Transportation and sow doubt about the city’s street safety initiatives, it’s already doing a bang-up job. The Post and the Daily News both ran pieces yesterday basically lifting arguments straight out of the plaintiffs’ complaint [PDF] without a shred of analysis. Both papers repeat the same basic distortion: Bike lane opponents are fighting DOT’s agenda. But that’s not really what’s going on here. The plaintiffs — the group of politically-connected residents who go by “Neighbors for Better Bike Lanes” and have the backing of former DOT Commissioner Iris Weinshall, who happens to be married to Senator Chuck Schumer — are mainly fighting their own neighbors. If the DOT’s efforts to make streets safer citywide become a casualty in this fight, that’s collateral damage. Last October's rally for the PPW redesign: These are the people whom bike lane opponents are looking to circumvent via litigation. Let’s be clear: Residents of Park Slope asked for the Prospect Park West project. The idea for a two-way, protected bike path did not debut with DOT’s April 2009 presentation, as the Daily News suggests. It was not imposed, in the words of the Post’s Rich Calder, “to push an anti-automobile agenda.” The initiative to slow down speeding traffic on Prospect Park West and give people safer space to walk and bike predates Janette Sadik-Khan’s tenure at DOT. It came from people who live in the neighborhood — people who organized and attended public meetings and put together ideas for how to improve local streets. These are the people whom the “Neighbors for Better Bike Lanes” and their corporate litigator-turned-pro bono counsel, Gibson Dunn’s Jim Walden, are fighting. They are fighting the results of a community organizing effort that goes back to the days when Iris Weinshall was in charge of DOT. In 2006, well before Sadik-Khan became transportation commissioner, rampant speeding on Prospect Park West and Eighth Avenue emerged as a top concern at the Park Slope Civic Council’s annual traffic and transportation forum. Shortly thereafter, another neighborhood group, the Grand Army Plaza Coalition, made it a core goal to create safe bike access to and through Grand Army Plaza. A physically protected bikeway on Prospect Park West would address both those concerns, and in June 2007, Community Board 6 requested that DOT study a two-way separated bike lane on Prospect Park West [PDF] when it approved plans for a bike lane on Ninth Street (a project initiated on Iris Weinshall’s watch and completed under Sadik-Khan). 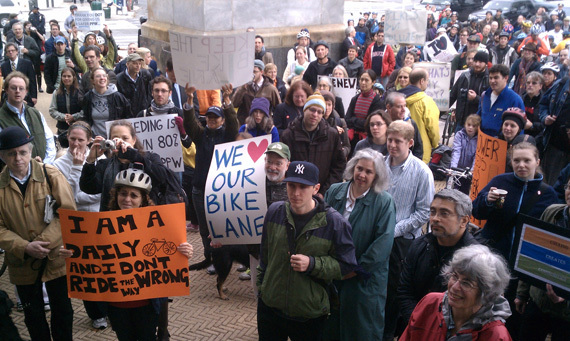 Sadik-Khan’s DOT then received 1,300 signatures requesting the bike lane, gathered by the group Park Slope Neighbors, before coming back to CB 6 with a proposal, which was approved by the full board in June 2009. A year later, the lane was installed. Radar surveys commissioned by DOT showed that the incidence of speeding dropped dramatically after implementation, and bike counts jumped substantially. The principal goals of the project, to reduce dangerous speeding, improve bike access, and get cyclists off the sidewalk, had been achieved. In a survey of 3,000 Brooklynites conducted by City Council members Brad Lander and Steve Levin and CB 6, more than 70 percent of Park Slope residents said they wanted the lane to stay. Whether the lawsuit has any legal validity is beside the point now. As a PR strategy, the plaintiffs’ complaint marginalizes broad public sentiment within their own community by naming DOT and Janette Sadik-Khan as defendants. DOT is getting tried in the press, while the wealthy insiders who are circumventing the public process with “pro bono” assistance from a top campaign contributor to Chuck Schumer are mostly getting a free pass. As you can see in the Daily News, the Post, and Walden’s face-off with Lander on Inside City Hall last night, the opposition is relying heavily on the fact that traffic injuries on Prospect Park West increased from four during the second half of 2009, to five during the second half of 2010, after the street was redesigned. The thing is, high-quality studies of traffic-calming projects rarely use year-over-year comparisons to evaluate effects on street safety. They use multi-year averages of injury data instead, especially to track events subject to bias from random variation. Statisticians know to look at numbers from several years to dampen the effect of outliers and statistical noise. In this federal study of traffic-calming projects, for instance [PDF], the “before” data uses multi-year averages covering time frames as long as 23 years. Not a single before-and-after case study cited in the report compares merely a single year’s data to the following year’s data. The methodology that Jim Walden and the PPW plaintiffs insist should have been applied to Prospect Park West is as simplistic and misleading as their insistence that the idea for the redesign was imposed from above. In its injury and crash report on Prospect Park West, DOT used a three-year average for its “before” data, sampling only the last six months of each year to align with the six-month “after” study conducted during the second half of 2010. In his complaint, Jim Walden says that this method “deviated from DOT’s usual approach in reporting its crash statistics.” Walden conveniently ignores other DOT studies that employ multi-year data sets on traffic injuries, like this report on the recent Allen and Pike Street redesign [PDF], which also used multi-year averages to measure injury rates before the installation of a traffic-calming project. DOT used a six-year average for “before” data on injuries in the Allen and Pike report. Why a three-year average for Prospect Park West? I can’t speak for DOT, but according to the plaintiffs’ own complaint, the city changed the signal progression on Prospect Park West in 2007. The period from 2007 to 2009 would thus be the longest possible time frame to collect injury data on Prospect Park West as it was engineered before the bike lane was installed. There was no “shaky math.” Data was not “manipulated.” A group of powerful people just don’t agree with their neighbors, so they have decided to litigate.